Carambola has the scientific name Genus Averrhoa, taste sweet and sour a lot of rage. Carambola has many health benefits. The taste is delicious and low in calories cause carambola is widely used as a dietary menu. 1. Star fruit skin contains a lot of dietary fiber. Fiber is good for preventing cholesterol in the body. Fiber also protects the mucous membrane of toxic substances. 2. Starfruit juice is rich in vitamin C, which can provide the benefits of antioxidants. In 100 grams of star fruit juice containing 57% of the daily requirement of Vitamin C. The antioxidants in the body also helps protect the body from free radicals. 3. Starfruit juice is a source of B-complex vitamins are good for the body. Vitamin B helps as a co-factor for enzymes in the metabolism as well as in a variety of synthetic function in the body. 4. 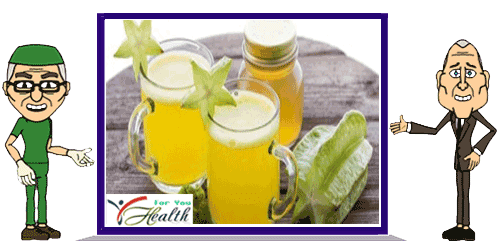 Starfruit juice is believed to be a diuretic or a drug to increase urine production in the body. Not only is star fruit juice only, to maintain the health you also need regular exercise, and adequate rest. The food is healthy and nutritionally balanced will always make your body healthy, fresh and fit. Hope it is useful.